I know for a fact that a ton of p eople are excited for August 13th to come. That’s because it’s the release date for Scott Pilgrim vs. The World, the movie adaptation of the cult comic book series. Written by Bryan Lee O’Malley, the Scott Pilgrim series follows 24 year-old Scott, known slacker and musician living in Toronto. When he falls for a beautiful indie American girl named Ramona Flowers, he thinks the hardest part is asking her out. As it turns out, the hardest part is defeating her seven evil-exes. And so, Scott must battle these exes, video game/manga style, while still getting to know the girl he’s fighting for. I am always a little wary of movie adaptations for books, but Scott Pilgrim has some really talented people involved in this one. At the top of the list is it’s writer/director Edgar Wright, who wrote and directed two of my favorite movies, Hot Fuzz and Shaun of the Dead. Second is Michael Cera, who I still adore despite a few poor role choices in the last few years (Year One comes to mind). 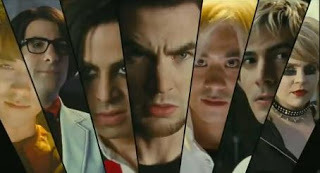 Some of the other notables are Brandon Routh, Jason Schwartzman, Kieran Culkin and Chris Evans. But perhaps the most inspired casting was Mae Whitman, who is easily best known as Ann “Her?” Veal, the girlfriend of Cera’s character in the cult tv show Arrested Development. Any movie that brings these two actors together again is OK in my book. Because I have not read the books, I’m not sure how much the trailer looks like the source material. If you are a fan, let me know if it seems on the right path. Wonder if this one is worth seeing in the theaters?